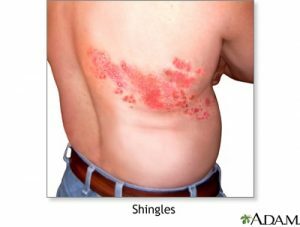 Many of us have either had shingles or know of a friend or relative who have had shingles before. If you have had chicken pox (and most people in New Zealand have), you are carrying the virus that causes shingles. The chicken pox virus never leaves your body – when you recover from chicken pox, the virus becomes inactive in the nerves in your spine, but can re-emerge as shingles later on in life. Shingles appear as painful blisters often on the body or over the eye and forehead – in some cases this can cause severe chronic pain and disability long after the blisters heal, and can be a threat to your eyesight. We at Auckland Family Medical Centre believe in preventive health. Just like it is better to prevent a heart attack before it happens, it is better to actively prevent shingles before you actually get it. A new Shingles vaccine has recently become available in New Zealand for people over the age of 50 years. It has shown to be effective in preventing shingles. The shingles vaccine is unfunded in New Zealand, but it is available at Auckland Family Medical Centre. Your risk of getting shingles increases sharply over the age of 50 with a 1 in 3 lifetime risk; and by age 80, 1 in 2 people will have experienced shingles. The vaccine will be free for those 65+ from the 1st of April 2018. We are happy to answer any questions you may have about the shingles vaccine – please ask your doctor or nurse next time you are here at Auckland Family Medical Centre and we’d be happy to help.